Be careful what you wish for. It’s an age-old phrase that we have all heard a million times, myself included. All throughout my childhood, in fact, my mom was uttering these words to me. Warning me that one day, I just might get what I asked for and it might not turn out quite the way I had expected. However, being young and arrogantly confident (aka nieve and ignorant), I would dismiss my mothers advice with a roll of the eyes and shrug of the shoulders, telling myself that there was no way I would ever wake up a millionaire or regret it if I did become so lucky, for that matter! But tonight, 15 years later, I have finally come to heed my mother’s word of advice. Unfortunately though, I had to learn my lesson the hard way…through personal experience. I envied Colombian lifestyle and repeatedly told my friends and family, how I wished that I could live so disconnected from technology, without my facebook and blackberry. Now, of course a magic genie didn’t appear and grant me my wish this evening, but a hoodlum robber from Coconut Grove did! This guy stole my phone, my I-pod, my wallet, my ID’s and credit cards, my car keys, my house keys, my textbooks, my entire 21st century life essentially. This weekend, I lived like a Colombian and learned the hard way that what works in Colombia, doesn’t really work in America. You can’t do anything without technology here. To comfort myself during this time of loss and anger, I resorted to my usual coping mechanism….FOOD! I cooked a lot in my apartment and also found friends to dine out with. Last night I had the chance to get to Sugarcane Raw Bar Grill in Midtown, which I have wanted to try for quite some time now. 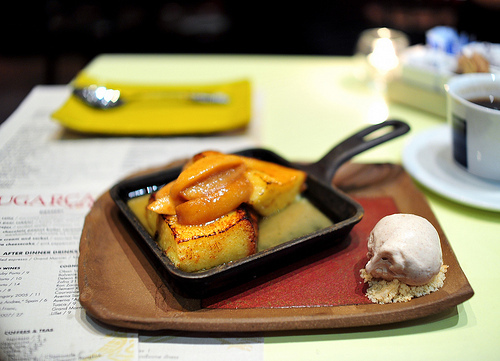 It is a rawbar and tapas style restaurant, with everything from sushi and crudos, to desserts and specialty mojitos. This is a great place if you are going out with a large group of people, because everyone can try a bite of each thing, but caution: little plates do start to add up expense wise. 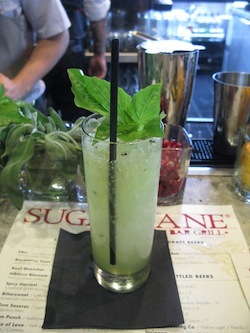 My first order of business upon arriving at Sugarcane, was getting a large alcohol beverage into my system. I certainly deserved it after my rough weekend!! 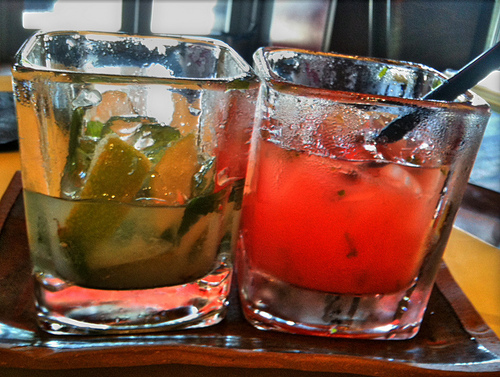 I ordered the Basil Quencher, which had muddled Kiwi, crushed basil leaves, rum, and sugar. It came over ice in a tall glass and was a refreshing and unique spin on a traditional mojito. I enjoyed the pulp from the fresh kiwi and clean flavor of the basil, but I did prefer my second cocktail choice more, which was the Strawberry Balsamic with Vodka, muddled fresh strawberries, aged balsamic vinegar, and fresh lime juice. This was probably the second my delicious drink that I have ever tasted, right behind the Chili Passion Martini from The Setai Hotel in South Beach. The balsamic vinegar was aged to a perfect sweetness and it complimented the strawberry beautifully. Again, the pulp from the fresh fruit added a nice texture to the drink, and the lime juice was just the right amount of citrus tang to round out the flavors. 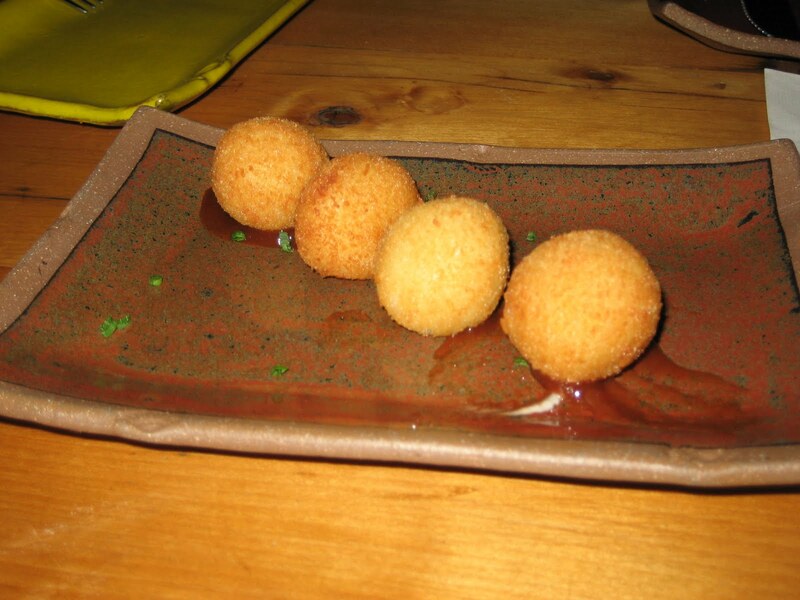 As far as food goes, we ordered a bunch of small plates to share, starting with the Goat Cheese Croquettes served atop a drizzle of Membrillo Marmalade. Given my love for anything goat cheese, I expected to enjoy these, but I didn’t think that they would be anything special since they are just fried balls of cheese. I was wrong though, because the membrillo marmalade added a really interesting a sweet flavor to the dish that took it from basic to inventive and unique. Next we ordered the Kobe Beef Sliders with Tonkatsu and Fried Quail Egg. I love kobe beef and sliders, but I had no idea what tonkatsu was and I was a little scared of the quail egg, which I have never tried before. I see them in the supermarket sometimes and they freak me out, so I was apprehensive, but this little slider packed a ton of mouth-watering flavor and the quail egg was a perfect addition. I sank my teeth into this burger, allowing that delicate yolk to break and dribble right down my chin. It was divine and the tonkatsu (which I assume to be the sauce) was incredible and had a slightly peppery and spicy flavor. I asked for an extra side, which I proceeded to dunk my slider in with each bite! 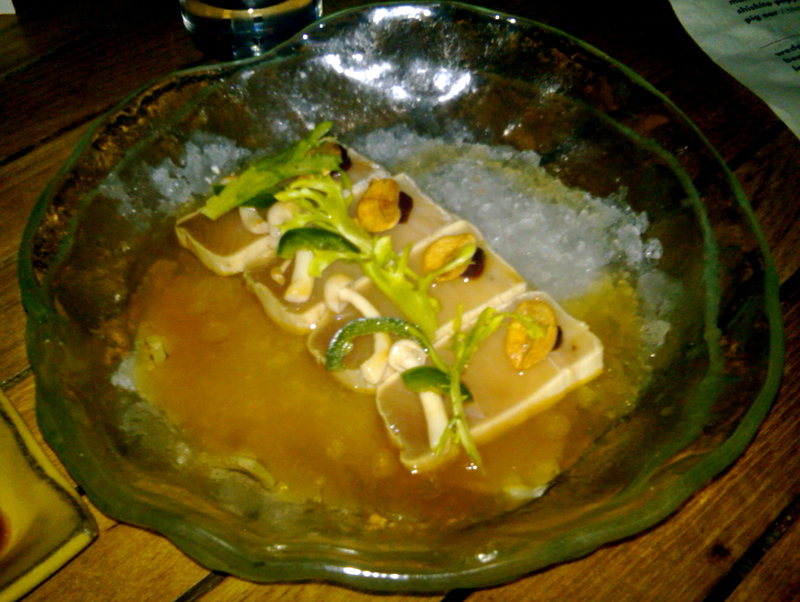 Next to arrive at the table was the Tuna Crudo Special with Black Sesame Oil, Marinated Mushroom, and Garlic Chip. The waitress highly recommended this dish, but I was rather unimpressed. I didn’t feel like it had enough flavor, unless you got a bite with the garlic chip, which were far and few between. The mushroom and herb garnish didn’t really enhance the flavor of the dish, although they helped with presentation. I regretted not going with my gut instinct and ordering the tuna tartar, but you can’t always win! 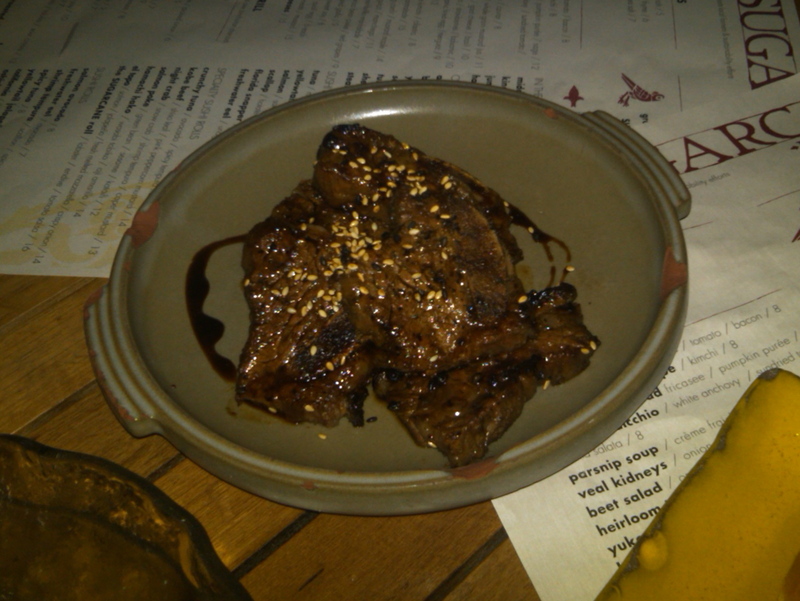 The last small plate we shared was the Korean Style Beef Short Ribs, which were really good. The plate came with six ribs total, but they were very small. I wasn’t really wowed by them, but the sauce they were in was tasty. Unfortunately, we got stuck ordering these primarily because they sold out of the Brussels Sprouts infused with Orange and Soy. I have heard that these are one of the best items on the menu, and a must try. I figure that they must be pretty incredible since they were sold out! My favorite part of the meal though was hands down dessert! We ordered two different ones to share, including the Ricotta Cheesecake with Pink Peppercorn Nougat as well as the Torreja with Maple Carmel Apples and Cinnamon Ice Cream. The torreja, which is almost like a french toast, was by far the best. It was hot, soft, and gooey in the center yet crispy and well-done (but not burnt!) on the edges. The cinnamon ice cream was served with piecrust crumble all around it, and the maple carmel apple slices were just divine. 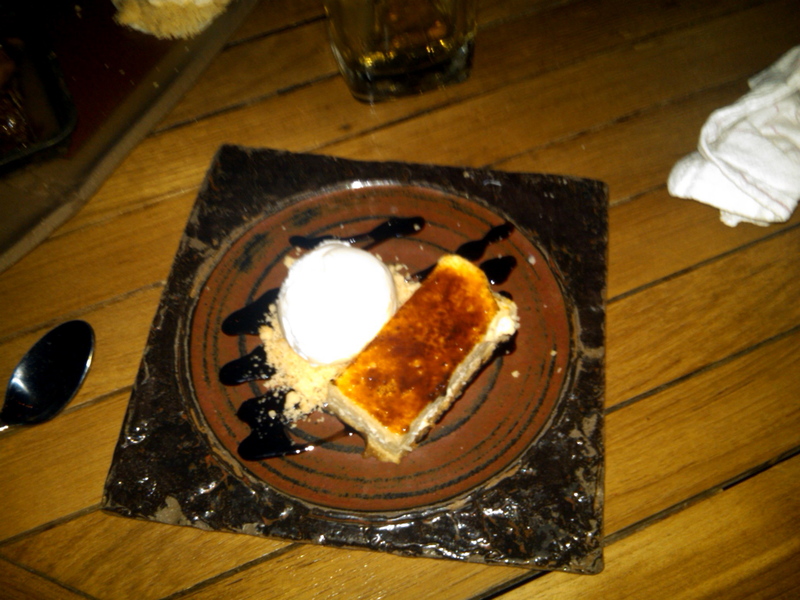 The ricotta cheesecake was also very good, but I am Italian and like my mom’s traditional version better. This one was served with a carmelized sugar top, almost like a crème brulee, accompanied by vanilla ice cream and piecrust crumbles. The cake was very rich and creamy, but again, I prefer my mom’s homemade citrus version better. Overall, fabulous meal and I will definitely be going back. I could go back just for the strawberry balsamic drink and torrejas alone! Great place, and reasonably priced. They don’t use a lot of ingredients on each plate, but the food has a lot of unique flavor (with the exception of the tuna crudo special tonight). Also, don’t be afraid or overwhelmed by some of the culinary terms that they use. It sounds fancy, but in most cases it is just another way of saying sauce or garnish! Go to Sugarcane!! 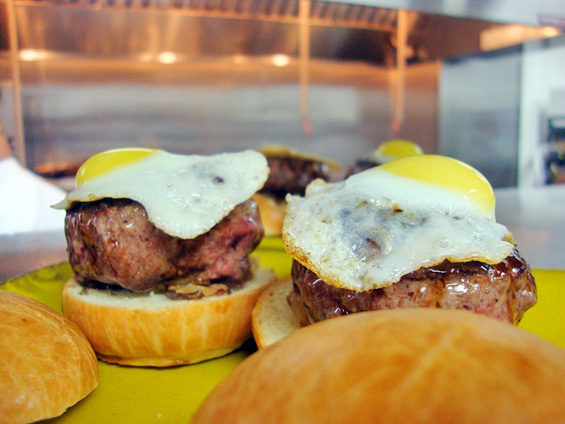 all this food looks so… the Kobe Beef Sliders with Tonkatsu and Quail Egg looks amazing! !